The pedestrian area of Essex Street in Salem near the fountain and Peabody Essex Museum. I was walking to Salem this morning to downtown Salem to meet up for breakfast. It was Labor Day so things were pretty quiet at 7:30am as I strolled on by. I thought this was a perfect opportunity to catch this side of the fountain along with a slice of the Peabody Essex Museum in the background. It took me a while to realize that the islands in the fountain represent Salem and Marblehead (or at least that's what I've been told). 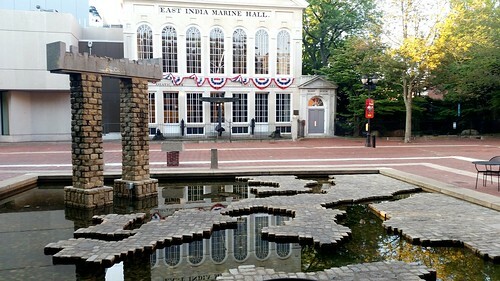 However, I loved that you can see the reflect of the East India Marine Hall in the water along with some of the trees. Also, since this was so early, there were no pedestrians to ruin the shot (ok--ruin might be a bit strong there).